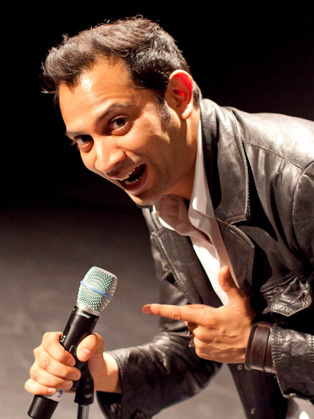 Anil Desai has been invited onto many of the world’s best comedy and entertainment stages including The Comedy Store, Late & Live, The Udderbelly, The Wellington Opera House, Her Majesty’s Theatre, London, as well as comedy festivals around the world, such as at Edinburgh, Melbourne, Sydney, New Zealand and Ireland, where he has performed several solo shows. Desai’s unique brand of feel good, energetic, stand-up comedy is based on his real-life stories, experiences and observations - at times dry, occasionally sarcastic, but with genuine honesty and an optimistic wisdom, from his love of movies, and film-stars to his everyday life, global travels, relationships and the ever-changing state of the world and it’s cultures. A possessed schizophrenic tour-de-force...more than an impressionist, combining typical observational stand up with voices making him a force to be reckoned with. Catch him before you're too far back in the arena to see him. Highly entertaining stuff from an accomplished act…must be seen to be believed.